If you think you don’t like beets, you haven’t had them like this! The vibrant color alone makes you want dive in with a delicious piece of toasted pita. I know I don’t share a lot of savory recipes, but I’m going to start sharing some of my favorite party recipes that are great for entertaining! 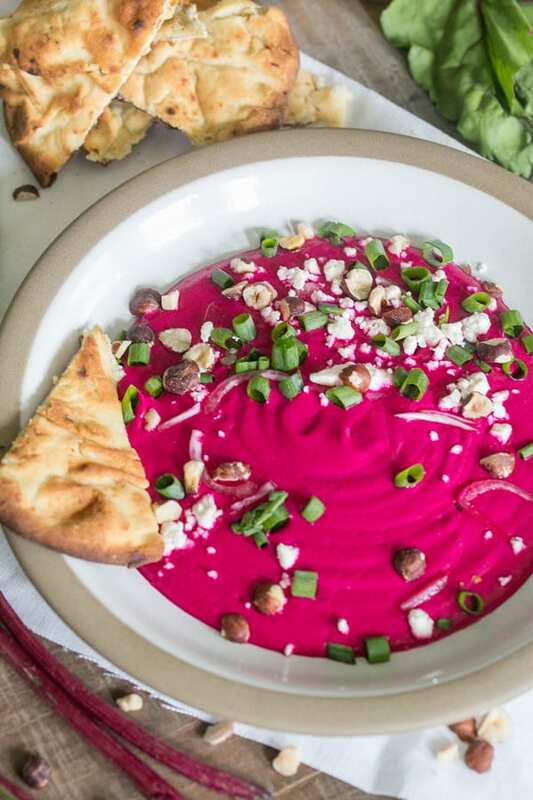 This dip is made with roasted beets, yogurt, olive oil and lots of garlic. It’s topped with hazelnuts, feta and some green onions. 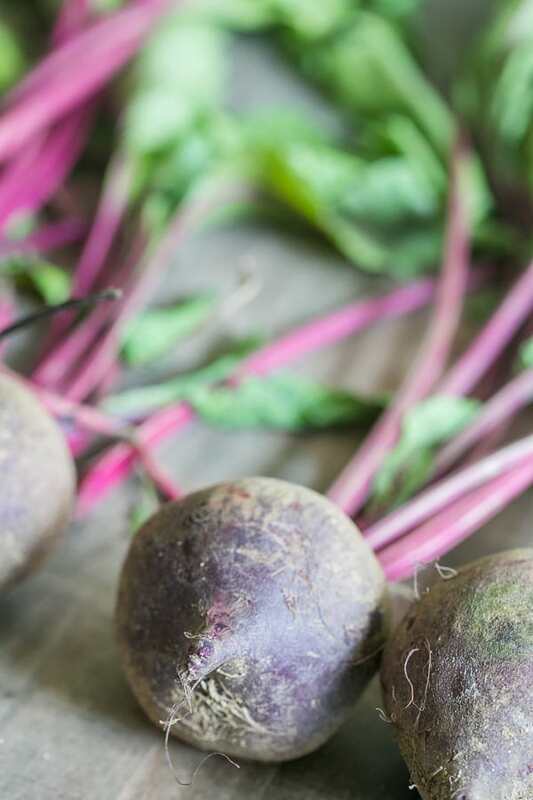 The lively shade of dark pink color will entice the worst of the worst beet haters! I think I’m going to serve this as an appetizer for Thanksgiving. Put the beets in a small baking pan with a small amount of water. Roast in a 350 degree oven for 1 hour. Add beets, garlic, yogurt, olive oil and chili powder in a food processor or blender and pulse until smooth. Garnish with feta, hazelnuts, shallots and green onions. vivid! i’ve loved beets for as long as i can remember. I can’t even wait to make this. I’m obsessed with beets! Yay!! You’re the best Jill! What about using canned beets? I’ve never tried canned beets… I don’t know if it would be as fresh tasting, but if you need a quick dip maybe it’s worth a try! do you blend when beets are hot. Do you serve this hot or cold? 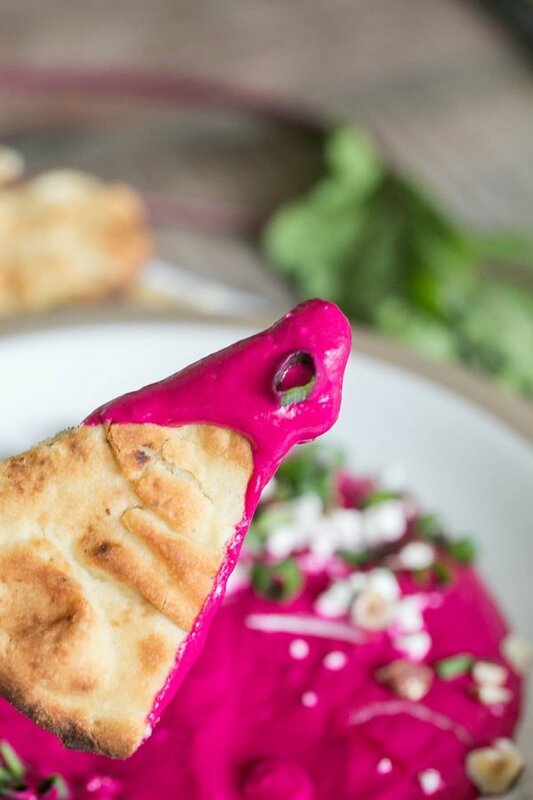 So would you use pita bread to dip into the beet mix or tortilla chips? What would you use? You don’t mention this. How many days in advance can this be made? Will it freeze? We didn’t try freezing it, but you can make it the day before and it will last a few days.